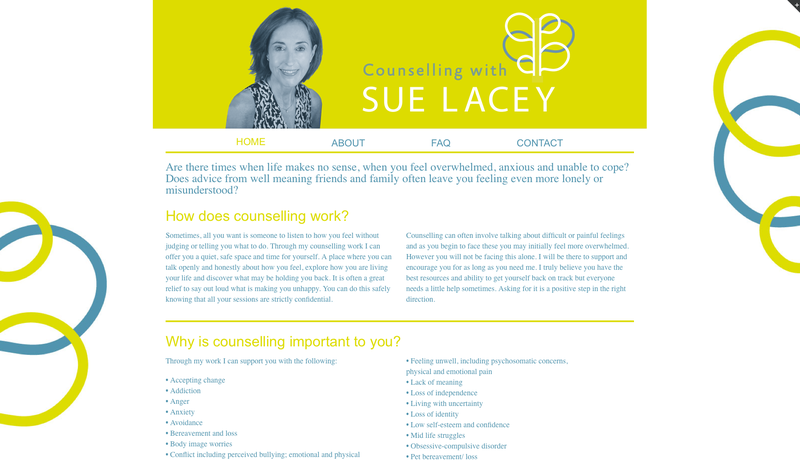 With a counselling practice in nearby Surbiton, Sue Lacey was looking for a website where prospective clients could go to find out more about her approach and the different types of therapy offered. As well as creating the brand styling used on print materials as well as for online, we built a website that would fulfill the needs of this local business. A four page website with a static banner, the emphasis was on simplicity, ease of use and, above all, information. A home page provided information about the different situations where counselling can help and how it works, an About page provides details of Sue Lacey background, experience and qualifications and the FAQ page answers attempts to answer questions that the user might have about the counselling service. A final page offers instructions on how to locate the practice as well as a contact form, allowing users to easily get in touch.